Join me at the New York Academy of Medicine for the Tenth Annual History of Medicine and Public Health Night on Wednesday evening, January 30th, when I present my paper entitled Organotherapy, Gilded Manhattan, and Wound Healing Research in the Early 20th Century. This presentation will explore the unrecognized and forgotten contribution of Serge Voronoff (1866-1951) to wound healing research – a story that evolves against the backdrop of medical science and mansions of early 20th Century Manhattan. 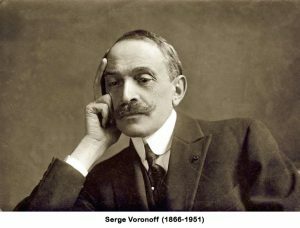 Seeing the suffering of injured soldiers during World War 1, Voronoff realized the importance of hastening wound healing and its potential benefit to medical science. He collaborated with a nurse, Evelyn Bostwick, a Manhattan heiress who he eventually married, on wound healing research. Evelyn’s father was a founder of Standard Oil with JD Rockefeller, and grew up in a palatial mansion on Fifth Avenue. With her assistance he experimented on artificially induced wounds in animals using slices of testicles. After WW1, Dr. Voronoff attained notoriety for his theories of human rejuvenation, accomplished through transplantation of testicles from monkeys into aging men. He maintained a thriving surgical practice until his work became discredited in the late 1920’s, leading him into forgotten obscurity. Few are aware, however, of his research on wound healing, performed in France during World War 1. Although his experiments sound farfetched today, at the time he was at the forefront of medical science. This was years before the establishment of the field of endocrinology, and over a decade before isolation of testosterone. Many years later, anabolic steroids were adapted for burns and pressure injuries, but by that time Voronoff’s work was forgotten. The Tenth Annual History of Medicine and Public Health Night will be held Wednesday, January 30, 2019. There will be several other presenters with different topics on the history of medicine. Attendance is free but registration is required. For more information and registration for History Night click here. For a Facebook page devoted to Dr. Voronoff (in Italian) click here. Here is a link to Dr. Voronoff’s biographer (in Italian). For a blog devoted to Dr. Voronoff by Aaron Voronoff Trotter click here.